Symphony No. 3, �The Muses�a (1937) [34�45]. Piano Concerto No. 2b (1958) [20�16]. Neptune (1933, rev. 1935) [24�22]. 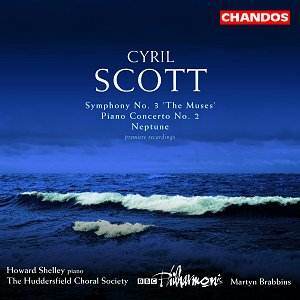 Chandos�s enterprise in the recording of British music takes them deep into uncharted waters with this CD of the music of Cyril Scott (1879-1970). Enterprise indeed, because although the booklet cover does not claim as such, the �première recordings� of both the symphony and the tone-poem are in fact first performances, making this altogether a most important document, and it would be only right to acknowledge the assistance of the Ralph Vaughan Williams Trust in the making of this CD. Performances of Scott�s works in his later years were infrequent. Despite the advocacy of so eminent an authority as Sir Thomas Armstrong, a Cyril Scott Society faded not long after its formation in 1962 and after his death his works sank into even deeper neglect. A fair assessment of his music has therefore been very difficult. The interesting Marco Polo all-Scott CD recorded in South Africa in 1993 (8.223485) included a range of works, from the early Debussyian Aubade and the Three Symphonic Dances that were reworkings of his Second Symphony (1903) to the Two Passacaglias on Irish Themes of 1914, the 1928 Suite Fantastique and the later Neapolitan Rhapsody. Yet with none of these works could one make any great claim on Scott�s behalf. However, this Chandos CD brings some pleasant surprises in three very substantial works, one of which shows us the fully-developed Scott in his last years. Rather oddly, he did not mention any of these important works in his second volume of autobiography completed the year before he died. At first it might seem a pity to have included the Second Piano Concerto on this CD of otherwise unknown works. Both the Second and the First Concertos were recorded in 1976 for a pair of Lyrita LPs (SRCS81 and 82, never re-issued), with John Ogdon as soloist and Bernard Herrmann conducting the London Philharmonic Orchestra. Herrmann�s Decca LP of British Film Music recorded the previous year (and subsequently transferred to CD) might have warned us that in later life he favoured tempi broader than those we are used to. Sure enough, the Lyrita recording of the Second Concerto (itself a first performance) takes almost 25 minutes compared with about 20� minutes on the new Chandos (and comparisons with other known performances of the First Concerto tell a similar story). So now at least we are able to judge the work more fairly. The second concerto is typical of the later Scott who had withdrawn into his own very personal and highly chromatic harmonic world based largely, as he explained in the appendix to his autobiography Bone of Contention, on his favoured basic chord (1,4,7). There is no key signature and the time signature is constantly changing. Howard Shelley makes a very convincing case for a work that may not warm easily to the listener on a first hearing but yet contains passages of beauty and merits repeated hearings. This is probably only its second performance ever. It is the other two works, however, that show Scott in new light and even shake off a few misconceptions. Neptune is a revision of a work that originally carried a title open to witty comment if things went wrong in performance: Disaster at Sea. Reviews of the early version, conducted by Albert Coates at a Royal Philharmonic Society in October 1933 in a barely half-full Queen�s Hall, were not favourable. Scott�s was not the only �new� work. The Times critic wrote that �it would be pleasant to declare that the absentees missed a newly discovered masterpiece in Polaci�s Sinfonia and a never-to-be-forgotten first performance in Cyril Scott�s Disaster at Sea but that would be to exaggerate the consequences of their lack of enterprise�. Scott�s only comment was that �although Ernest Newman wrote that he found "much to interest him" in the work, the other critics called it �cinema music�; not, as one of them said to me, because they disliked the music itself, but because the temptation thus to describe it had been too great to resist!� (This was probably thinking back to pre-sound days when symphony orchestras would sometimes accompany the showing of silent films.) Yet by today�s standards the work � or rather its revision � may now seem even more cinematic, with its massive orchestral outbursts supported by full organ, wind machine and other effects that have become part of cinema�s musical language. Quite how far Scott went with his revision two years later, leaving a work nearly 25 minutes long, and how closely Neptune (dedicated to Albert Coates) relates to Disaster at Sea, are difficult to say. But there is no escaping the programmatic planning with the number of details that clearly survive in the revised version. The work�s almost static opening � pizzicato cellos, that then glissando to a higher note, and harp arpeggios �suggestive of the gentle lap of small waves against the side of a vessel� � gives way to the first massive climax, with timpani thundering away against full organ à la Strauss�s Also Sprach Zarathustra as the liner comes into view with what Scott originally called the liner-motif. At (10) 3� 21" a fog-horn sounds (glissandi brass) and then, after another climax (the collision) and much allegro agitato with wind machine, a further detail seems to have survived the revisions: at about (11) 3� 57" and then again at 4� 25" we hear something remarkably like a Morse Code signal being dispatched. Perhaps, too, the snatches of waltzes at  hint at the �frivolity, pleasure-seeking, idleness, and luxury� on board the doomed liner. At (11) 7� 12" we hear the first clear statement of the first two lines of the hymn Nearer, My God, to Thee that legend has it the band were playing as the Titanic went down. It is thereafter alluded to right to the end of the work. There are, of course, at least three different tunes that have been attached to those hymn verses written by Sarah Adams. In his film, Titanic, perhaps with his American audience in mind, James Cameron chose to use Lowell Mason�s tune that is familiar in the United States. The tune that Scott uses, however, is one that is known in England, called �Horbury� and composed by that stalwart of Hymns Ancient and Modern, John B Dykes. (Yet in a fascinating article on the Internet, Bernard S. Greenberg convincingly argues that the tune more likely to have been played was an alternative one by Arthur Sullivan. Not only was this the tune used in the Titanic bandmaster Wallace Hartley�s own parish church where his father was choirmaster, but its opening bars were inscribed on his tomb.) The work ends with two full statements of the hymn tune,  1� 13"", on the second occasion on strings against the lapping of harps as if they were strains eerily coming from the sunken liner. Scott clearly wanted to rid the work of its Titanic association and to throw us off the scent by linking it instead to the god of the sea and re-naming it Neptune. Yet perversely, with the general interest today in anything Titanic, it might even be in the work�s survival interest to retain the original title. One can imagine it �going down well� at the Proms, especially in so impressive a performance as this. The Symphony �The Muses� (which comes first on the disc) is dedicated to Beecham, perhaps in gratitude for his conducting the first performance of La Belle Dame sans merci at the 1934 Leeds Festival. While not a steady champion of Scott�s works, Beecham had earlier been responsible for a number of first or early performances, among them Helen of Kirkconnel for baritone and orchestra, the Aubade, Two Passacaglias on Irish Themes, Piano Concerto No 1, and Melodist and the Nightingale for cello and small orchestra. The four muses represented are �Melpomeme, the Muse of Epic Poetry and Tragedy�; �Thalia, the Muse of Comedy and Merry Verse�; �Erato, the Muse of Love and Poetry�; and �Terpsichore, the Muse of Dance and Song�. If one can draw parallels in Neptune with film scores, one can just as easily do the same with parts of �The Muses� � which is a kind of back-handed compliment to Scott�s ability to create mood or atmosphere. The opening pages could grace many a Hammer horror film, tragedy being very much the key word, and its textures and mood in some respects resemble the opening of Bax�s Second Symphony in its powerful build-up. Even a wind machine adds to the bleak picture. At 9� 11" epic poetry is surely represented by a wonderfully Ravellian passage that is heavily indebted to Daphnis and Chloe. It is not until the quiet characteristic rising and falling phrase at 11�40" that we can feel with certainty the unmistakable stamp of Scott. The second movement is a scherzo of tremendous energy and spirit. This is not merely light comedy for the merriment is impish, Puckish, with tricks that the Gods play. Scott�s brilliant scoring may surprise many listeners. The slow movement is a lush L�après-midi but with an uneasy and uncertain resolution. The last movement opens with timpani and wind machine, and immediately a steady rhythmic pulse � a sort of moto perpetuo � drives the wordless chorus (with a nod again to Daphnis) to its climax with organ. At many places in this symphony one is pleasantly surprised at Scott�s feeling for momentum; there is nothing here of the languid want of direction one has felt in lesser works. This is altogether an impressively engineered disc with very persuasive performances from the BBC Philharmonic under Martyn Brabbins that hopefully will encourage a fresh assessment of Scott, one that is not based on second and third-hand opinions. His contribution to the piano literature is fairly well-known, the Dutton label has issued two important CDs of his chamber works ((CDLX 7116 Piano Quartet in E mi and Piano Quintet; CDLX 7138 String Quartets Nos. 1, 2 & 4), but his orchestral output is largely unknown. Perhaps Chandos could now consider recording one or two of his other concertos and even his fine setting of Keats� La Belle Dame Sans Merci for baritone, chorus and orchestra. In the meantime one is more than grateful to them for bringing to life these three important works.